You’re cordially invited to join us for our holiday history read-along! Since our summer and autumn reading focused on World War II, we thought we’d finish the year with the same theme. Our new book is non-fiction but not as daunting as Inferno. 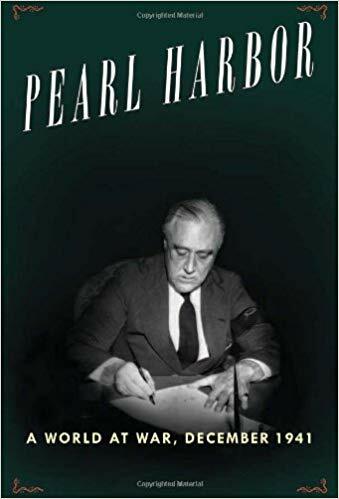 Just two hundred pages of large text and some photos, this book will focus on Christmas 1941 as Allied leaders Franklin D. Roosevelt and Winston Churchill met to discuss and decide on a war strategy while America reeled from Pearl Harbor and still sparkled with holiday lights. I’ve found copies easily at public libraries, and the book is also readily available through Amazon and other book sellers at reasonable prices. There are even e-book versions available! Christmas 1941 came little more than two weeks after the attack on Pearl Harbor and America’s entry into World War II. The shock and resulting ramifications of the attack had quickly reverberated worldwide, and for many – including the United States troops on Wake Island who were battling a Japanese landing force and, in the Philippines, losing the fight to save Luzon – it would be an arduous holiday spent far from home. In Japan, the Pearl Harbor strike force returned to Hiroshima Bay and celebrated its sweeping success, while across the Atlantic, much of Europe was frozen in grim Nazi occupation. Meanwhile, in the United States, festive Christmas light brightened the winter landscape despite recent blackout instructions as Americans attempted to go about celebrating as usual. But there was no denying the reality of the war. Just three days before Christmas, Winston Churchill met Franklin D. Roosevelt on an unprecedented trip to Washington, where they jointly lit the White House Christmas tree and toasted “the common cause.” As the two Allied leaders met to map out a winning strategy, the most incredible holiday season of the century swept across the globe. How are we going to do this read-along? Pretty similar to our previous ones. New posts on Wednesdays, and we’ll be reading three chapters each week. The blog posts will offer chapter summary notes, a quote or two, some extra history that I found interesting and wanted to further explore, and thoughts on holiday inspiration. So…even if you don’t want to read the book this year, you’ll still have some interesting Christmas-related history to enjoy! I hope you’ll read along with us or at least enjoy the blog posts about the book and history. book. Get your copy of Pearl Harbor Christmas this week ’cause we’ll be reading on the blog next Wednesday. I almost bought this book today but then I saw that it got some bad reviews on Amazon. Have you read it before? I’m currently research Pearl Harbor for a couple of novels that I am brainstorming. This will be my first read, but I’ve scanned parts of it back when choosing from a stack of books. I’m looking at some of the reviews and I think maybe the book wasn’t what some folks wanted it to be. It is a closer look at the holiday in Washington and the two Allied leaders, not a comprehensive study on Christmas 1941. I ordered my book–hoping to begin asap.